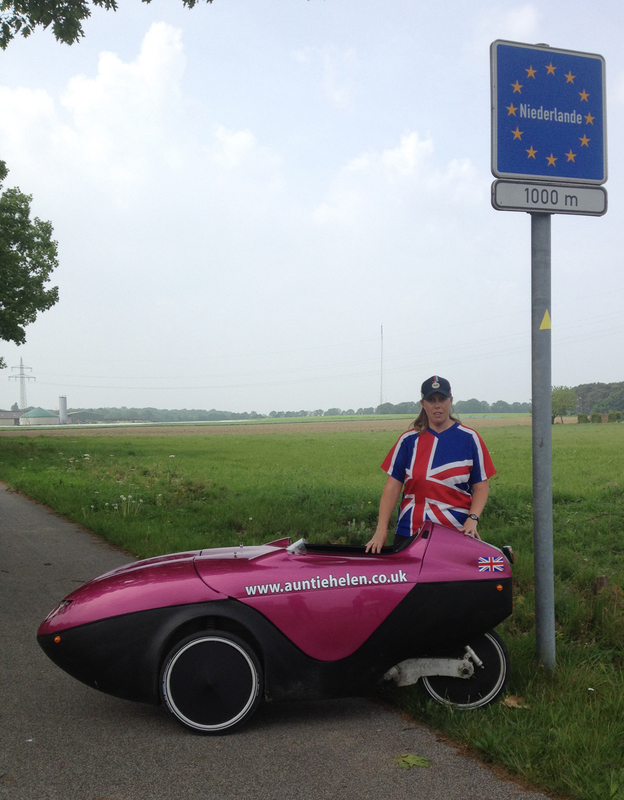 Today Penelope returned to her home country of the Netherlands. Today is 1st May and in Germany it’s a public holiday – thus most of the shops are shut. So it seemed like a good day to visit the Netherlands (I had already checked and that was still open). 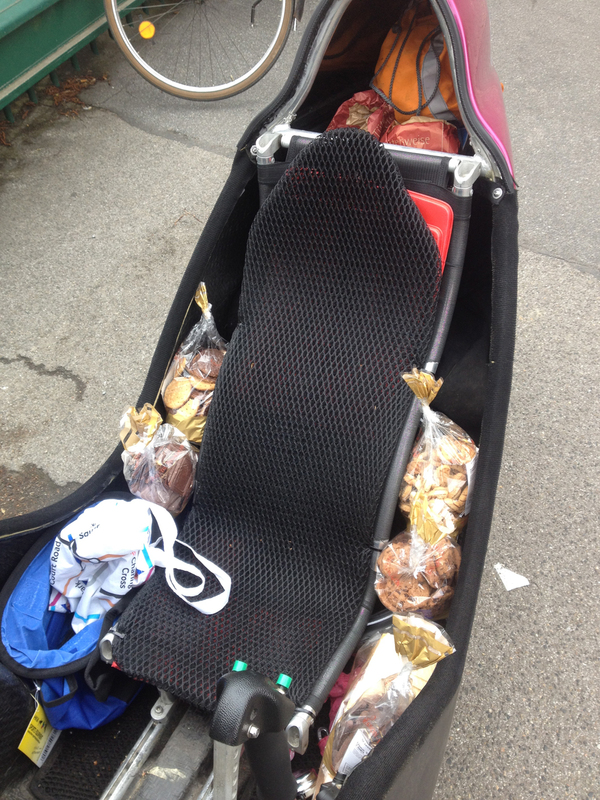 I had to fit it all into the velomobile which already had lots of tools, a spare tyre, a large casserole dish, some maps, a water bottle, a heavy lock, some Gü Chocolate Cheesecake dessert Pots, a couple of bread rolls, an Apfeltasche pastry, a loaf of sliced bread and some other stuff too. You can fit a lot of stuff in a Velomobile although I found the large free blue bucket that I was given by Self (a DIY shop) didn’t fit very well and I had to put it under my chin. 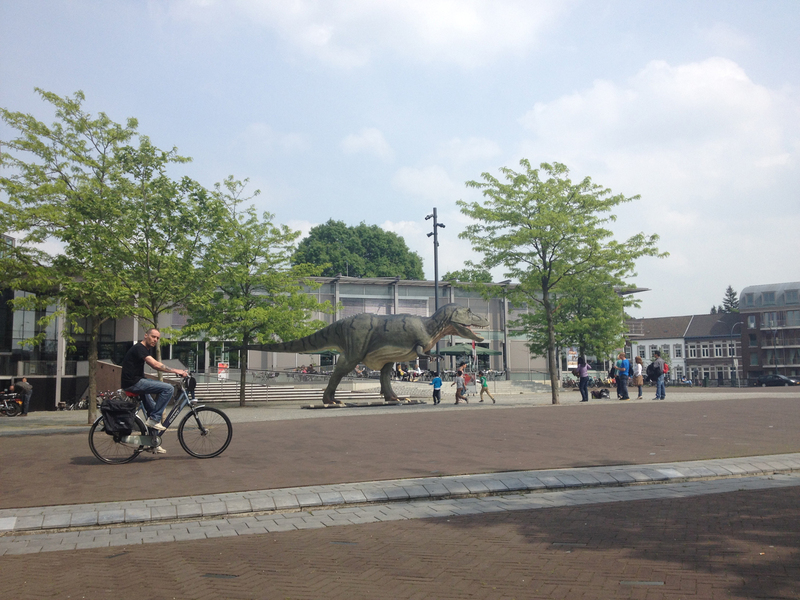 Anyway, 1st May seemed like a good day to take Penelope to Venlo, except I had to do some repairs first. Last night, when cycling back from choir in the dark, I realised that the lights weren’t working properly. 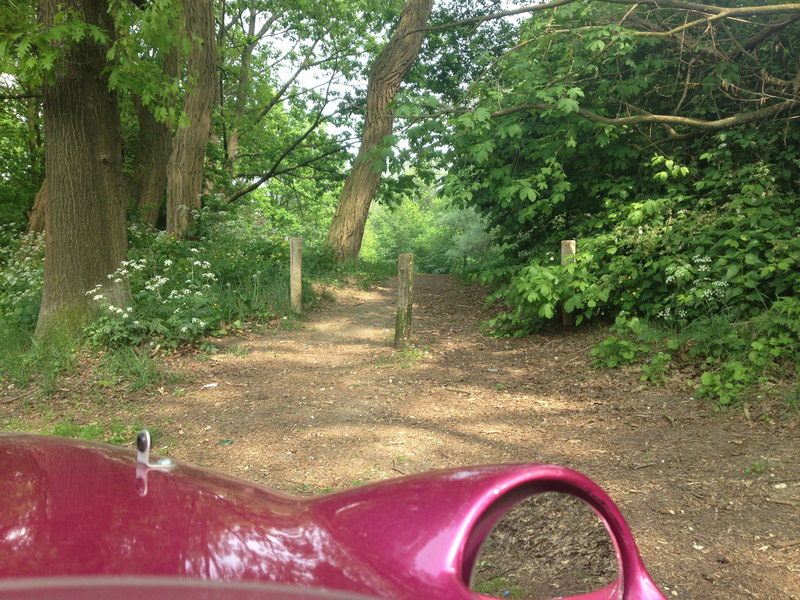 A previous owner, Wilfred, had arranged it so I have two front light settings – Bright and Brighter. There’s also the option of flashing the front lights using a button on the handlebars. Last night it became clear that the Bright setting wasn’t working, nor was the flashing, although if I switched on the second front light switch (for Brighter) then there was some light, although not enough to cycle fast on unlit lanes. Not only that, my car had been off the road for the last six days – the flat battery before I went to SPEZI was still not sorted. Frank (the landlord) had charged up my battery but it wasn’t working so he had brought a replacement from work today. First things first, a dog walk. 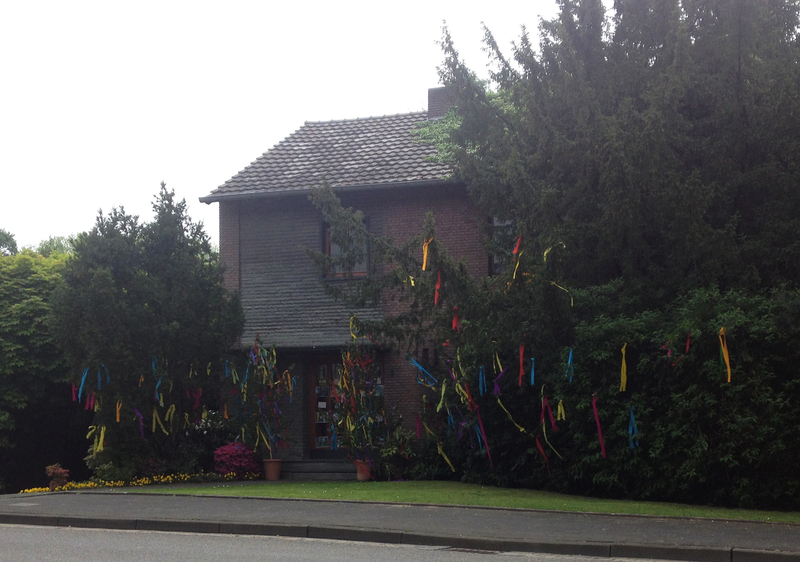 As I stepped out of the house I noticed that the tree outside was decorated with streamers. 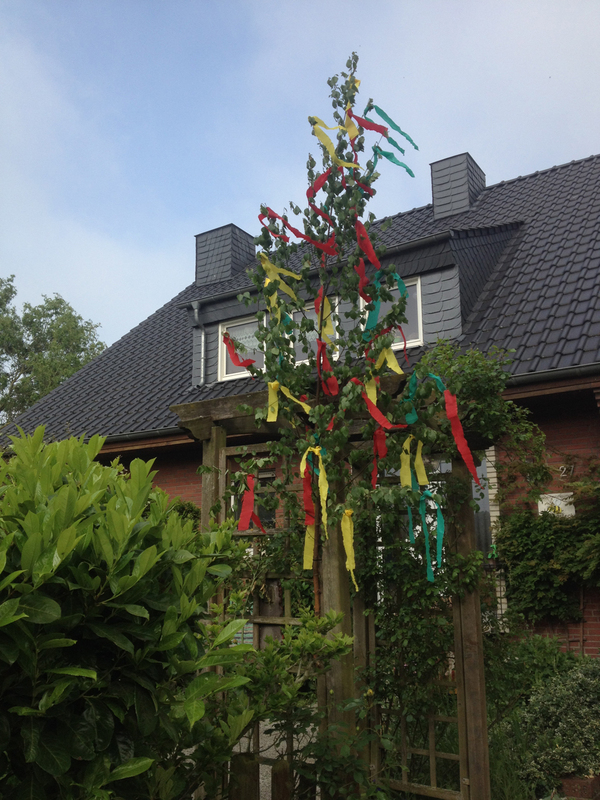 It’s a “Maibaum”, erected by young men courting a girl. http://de.wikipedia.org/wiki/Maibaum Have a look at “Liebesmaien”. Clearly it was for Lara (or possibly for Penelope?) but Lara is, as yet, none the wiser as to the secret admirer. Rather fun! Anyway, Pops and I went out for a good walk in the early morning sunshine. She took her stick with her. 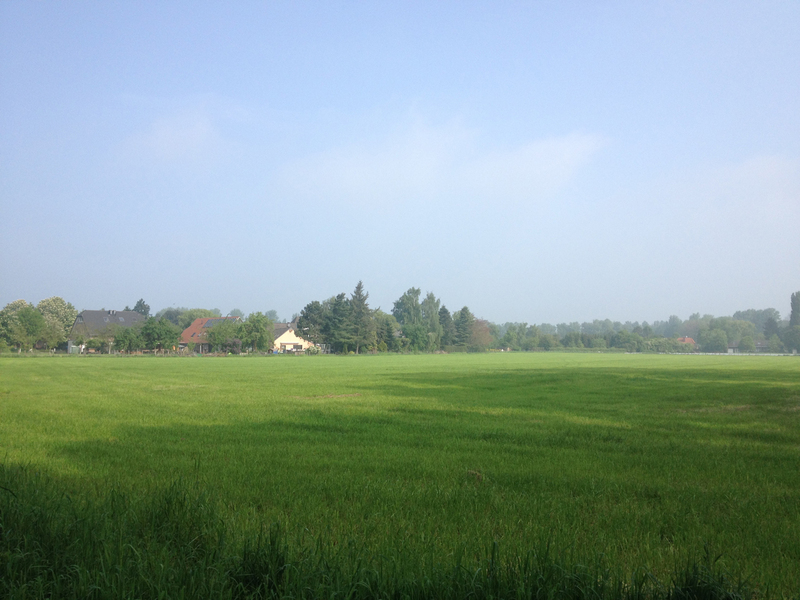 This is a view of Escheln, the hamlet where I live. Idyllic! 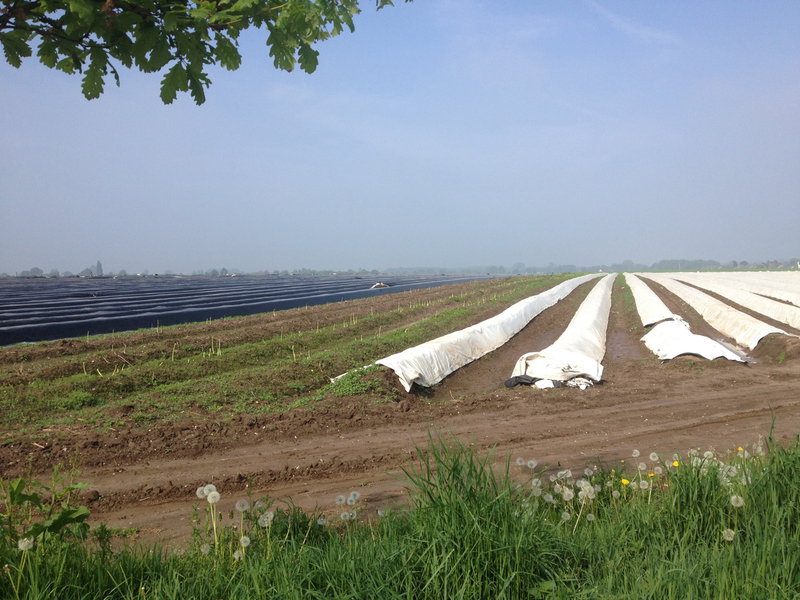 And here is the asparagus growing in the local Spargelhof (where I also get fresh strawberries most days). 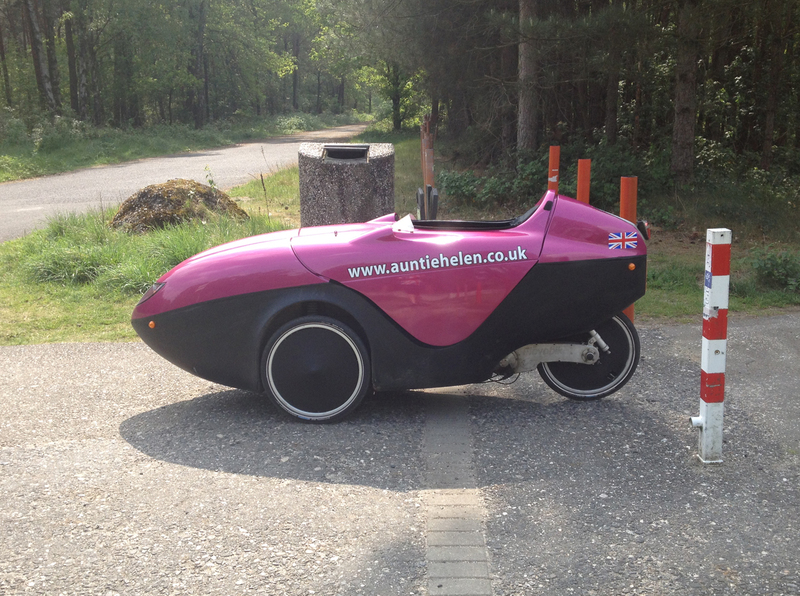 So back to the electric repairs on velomobile and car… with my electronic engineer husband in another country. Last night Alex, Penelope’s former owner, had told me that it was probably just a plug that had come out through vibration and it’s a pretty easy fix. So I stuck my head in to look – sure enough, the black box which should have had two plugs in it only had one – and the other one was dangling in mid air. Here’s a photo so you can see what I mean – a photo that was taken on 22 April, so over a week ago. Shows how observant I am that the light wasn’t working! 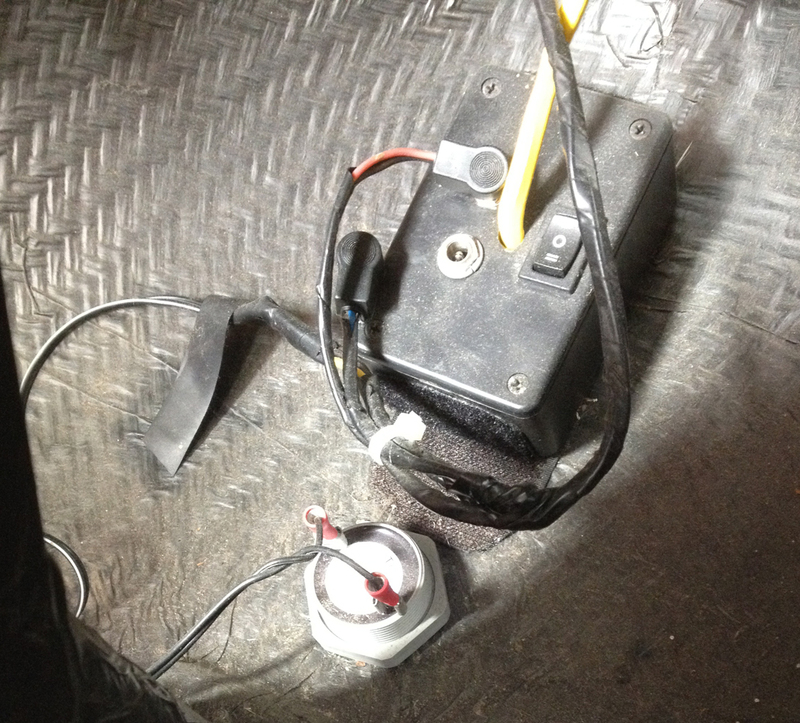 This is all right in the footwell beyond the pedals so I had to go head-first into the velomobile in a rather inelegant fashion but I plugged the plug in and lo and behold the lights now worked!! Buoyed by this, it was time to tackle the car (with Frank’s help). Frank put the new battery in and turned the key. The engine seemed to turn over OK but it didn’t start. Frank then disappeared into the garage and returned with a selection of tools. He proceeded to remove the spark plugs from the car and had a good look at them. With them out he then tried to turn the car on again for a bit – it was all a bit smelly but of course it didn’t start. He then put the spark plugs back in again (he told me the German for them – something Kerzen (candles)), turned the key and lo and behold the car started! 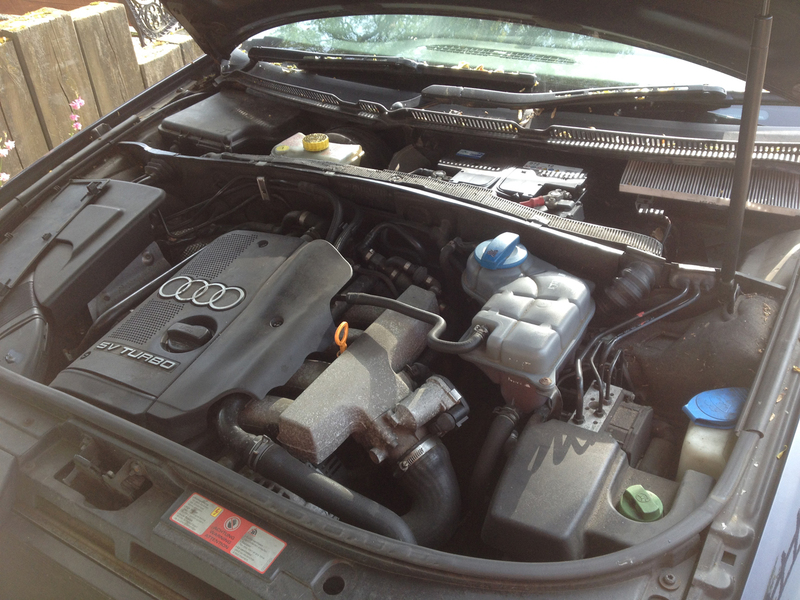 Frank’s diagnosis – because the car had been sitting for a couple of weeks, some unburnt fuel which had been there had settled and got a bit mucky. He suggested I take the car for a 10 minute drive to clear out the pipes and that I would need to use it once a week to keep this from happening again. He said he would also recharge the original battery, put it back in and see if it’s OK. 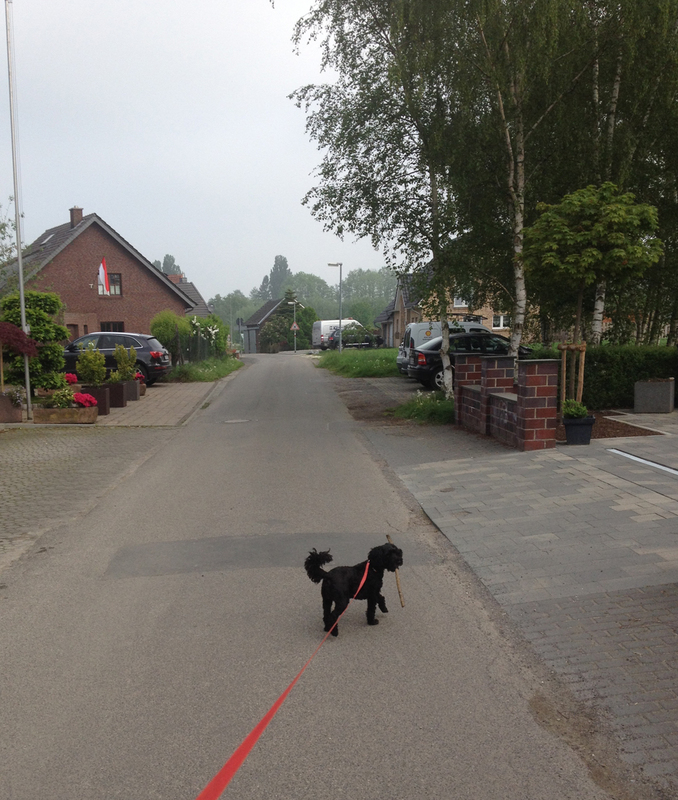 So I drove my car up towards Stenden and then back again. It was good to have had a successful morning of mechanical repair (although Frank gets all the credit for the car fix). Whilst we were doing the car Gudula took Poppy for a walk. As my Dad said to me earlier, I’ve really fallen on my feet in this household with dog walkers, car menders and more. I’m going to take the family out for a meal in due course to say thankyou for the car fixing. By the time I was ready to head out in Penelope it was 11:30. Gudula was in the front garden doing some pruning with Poppy helping so I asked her to hold on to Poppy as I headed off else Poppy would try to come with me. 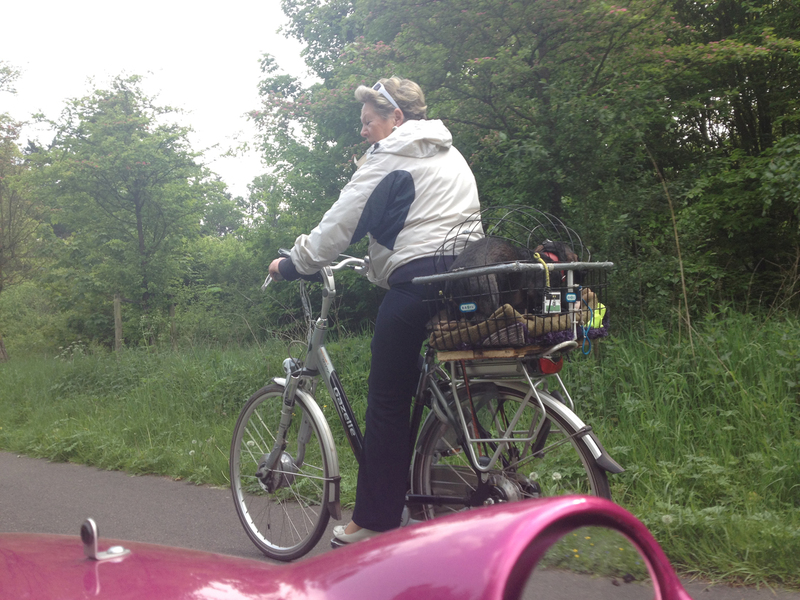 So Gudula picked Poppy up and talked to her while I headed off, following my Garmin’s route, towards the Netherlands. After about half a mile I heard a weird noise – weird, but familiar. The sound of running paws. Sure enough Poppy had just caught up with me. I stopped, opened the lid of Penelope and Poppy jumped onto my lap. I turned round and headed back to Escheln, seeing Gudula coming round the corner in hot pursuit. She said Poppy had gone first one way, then the correct one, trying to catch up with me, the little rotter! Poppy was panting after all her running and probably glad to be carried back to the house. I carried on another 200 metres or so and then stopped and waited for five minutes to check that Poppy didn’t reappear (she didn’t). Then it was full steam ahead to Venlo. I had plotted different routes there and back, the route to Venlo would be the most direct one and the route back a scenic option, if I felt energetic enough to do it. The northernmost track is my outward journey, through Wachtendonk, Wankum and Herongen. 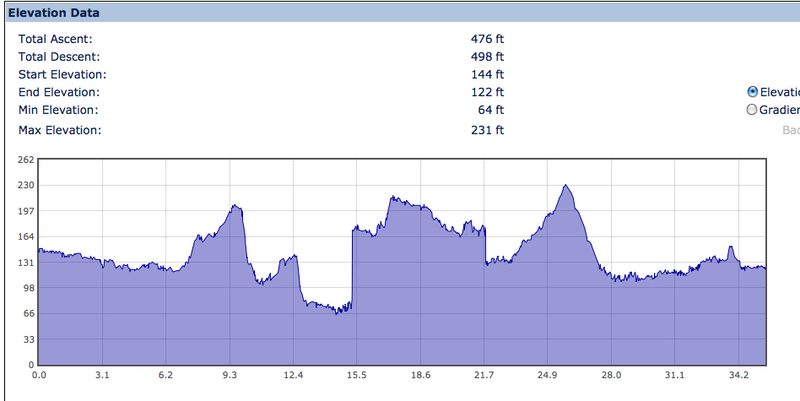 This is the elevation profile for the day as well – when the Garmin was switched off in Venlo for lunch it got its elevation a bit confused but it gives a general idea. I headed on the familiar route to Wachtendonk which goes under the A61 motorway on some farm tracks. However, today being 1 May there were more unusual things to see – not just the decorated tree. 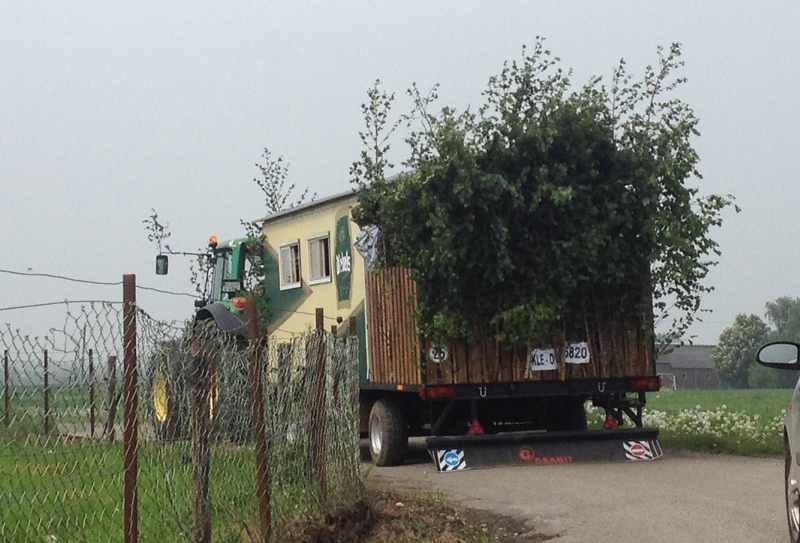 You can just see ahead in this photograph a tractor towing a sort of caravan thing decorated with tree boughs. This caravan thing was full of young Germans shouting and being generally noisy (probably with beer in their hands) and every time it passed a house the tractor sounded its horn at length. People then came out to see what was going on. A closer view – various arms were hanging out of the back window just before the branches at some points. 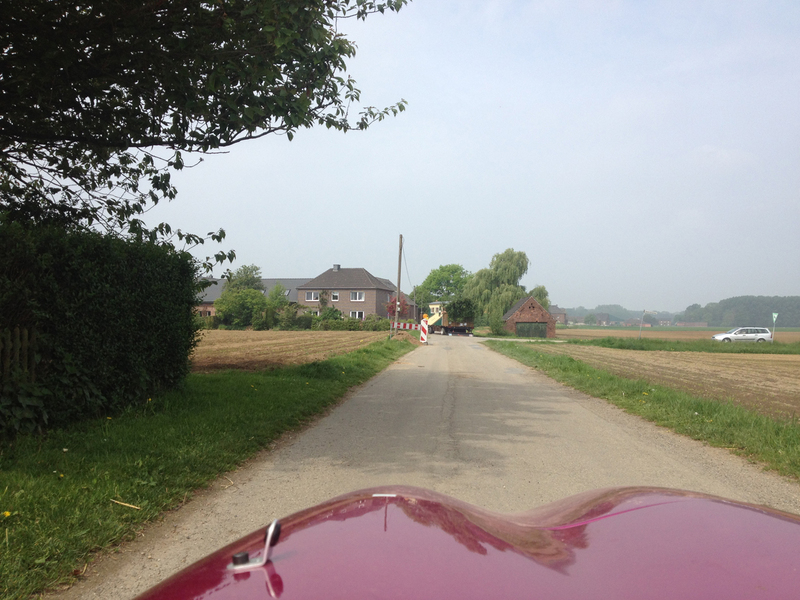 Eventually the tractor pulled over and a mini queue of cars (two, and of course me) went past. I was rather surprised to note that the tractor driver was a young girl – she can’t have been older than 20! It was all good fun and good natured. After Wachtendonk I ignored all the cycle route signs (I’ve done this trip enough times now) and took the main road to Wankum. Couldn’t resist photographing this bus stop sign. From Wankum (which was up a bit of a hill – was quite hard work) I headed to Herongen. Some young lady in Herongen also had an admirer! Herongen is right on the border with the Netherlands and I soon arrived at this sign, 1km to go to the border. There were two ladies taking photographs of themselves by the sign so I offered to take some photos of them together (which they were pleased about) and they then took this pic of me in return. Here are the ladies who were out on a random ride from Krefeld just to see where they got to. They said they do quite a lot of inline skating in the general area of Krefeld so I might see them about now and again. Whilst talking to this lady I noticed my Union Jack jersey was fantastically reflected in her glasses – unfortunately it hasn’t come out very well on the photo. 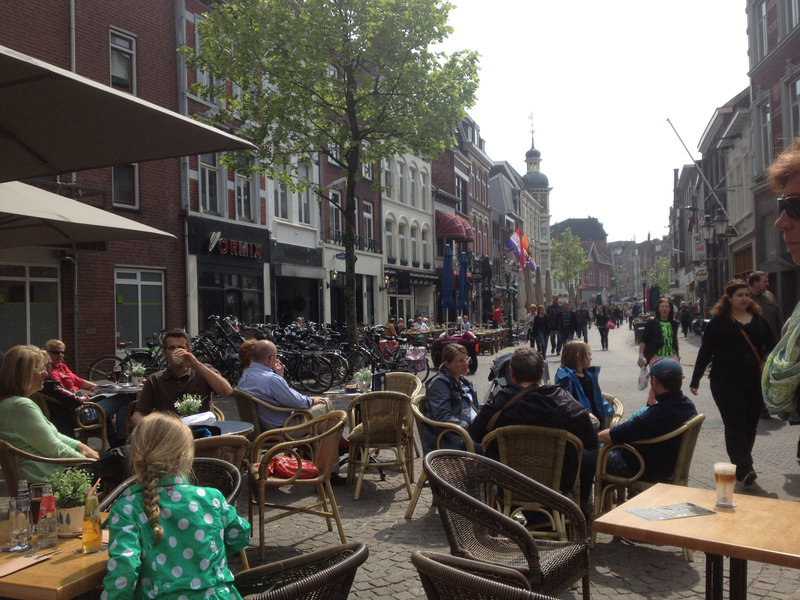 After a ten minute chat we headed off towards Venlo. Here is Penelope being welcomed back into her country of birth. 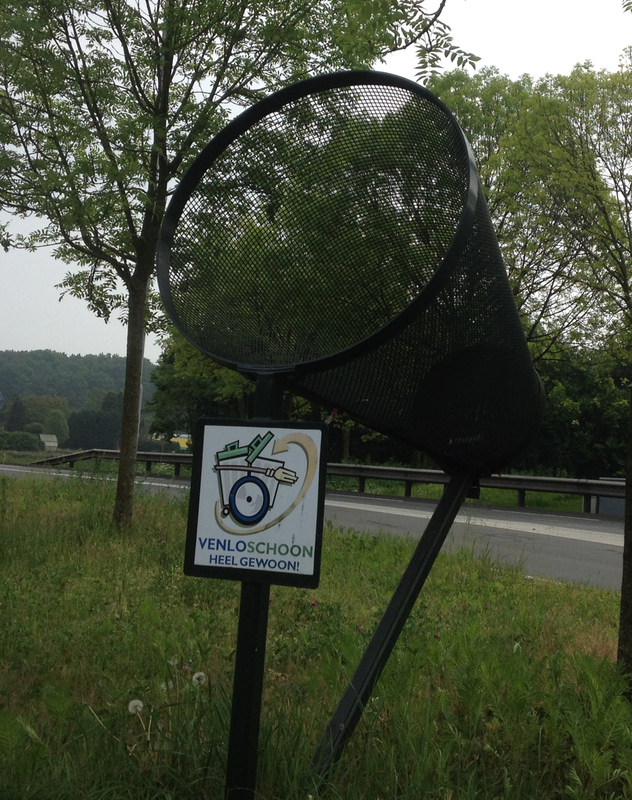 It was an easy ride along some reasonably main roads to the centre of Venlo. 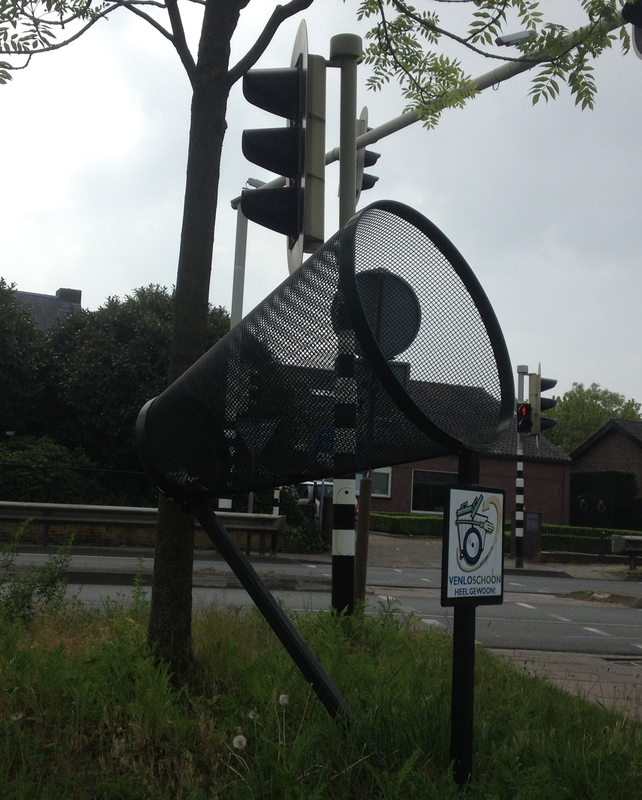 I was impressed by these bins for bicycle riders though – you could just chuck your litter into them. Less impressive were the buttons for the traffic light crossings – they tended to be difficult for me to reach from the velomobile (the ones in Germany seem to be in a slightly easier position). My original plan was to find some poffertjes (the little mini Dutch pancakes which I love) but I had failed to find them in Venlo twice before. However, this time I was a bit more successful in finding the pedestrian centre of Venlo, through which I cycled at least twice. No obvious poffertjes cafés. There was one café that said it did pannenkoeken but I asked the lady if they did pofferjes and she said no. At one point two policemen were walking past so I stopped them and asked if they knew of anywhere that served poffertjes. They said no but looked at me as if I was bonkers – clearly you don’t ask policemen for directions in NL like you can in the UK. In the end I gave up on the poffertjes quest (again!) and decided to just pick a random café to have lunch. As it happened I moved from the first one as the prices were really steep. I have noticed that in NL the cafés and restaurants don’t seem to have to display their menus outside so you don’t know what’s available until they bring you a menu. In Germany by law they have to display the menu outside the door of the building so you can check what’s what before you go in or sit down outside. The second place I stopped at seemed nice and I had a good view of Penelope – she had already garnered huge attention as I rode very slowly through the pedestrian area, now she was parked up people constantly peered in or photographed her. Service was a bit slow but I wasn’t in a hurry particularly. I was interested to note that almost everyone around me was German. I barely heard any Dutch spoken. 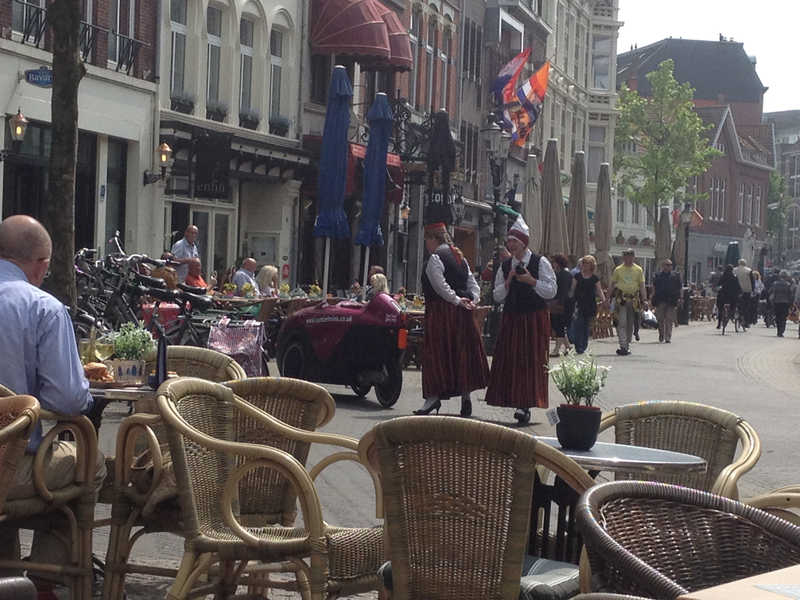 I suppose it was a normal working day for Dutch people whereas it was a day off for Germans but it was amusing. 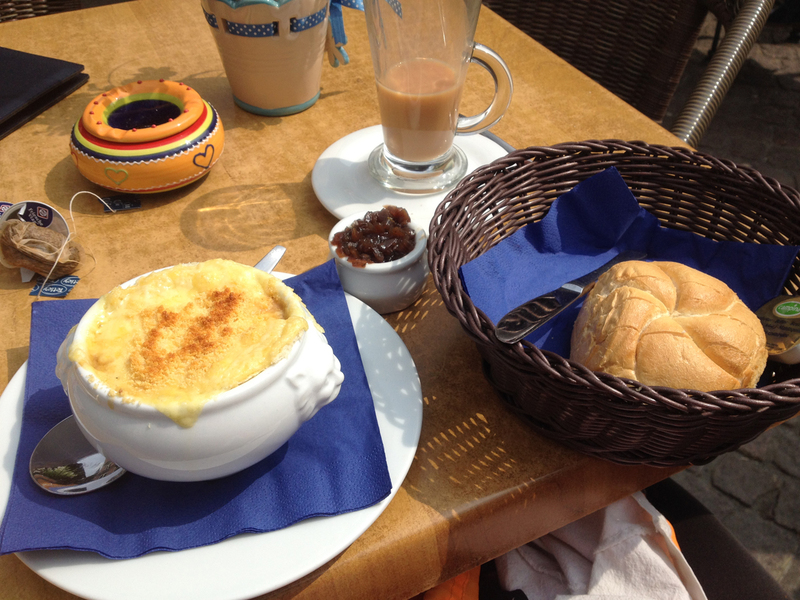 I did all my ordering and talking with the waitress in German – seemed easier. 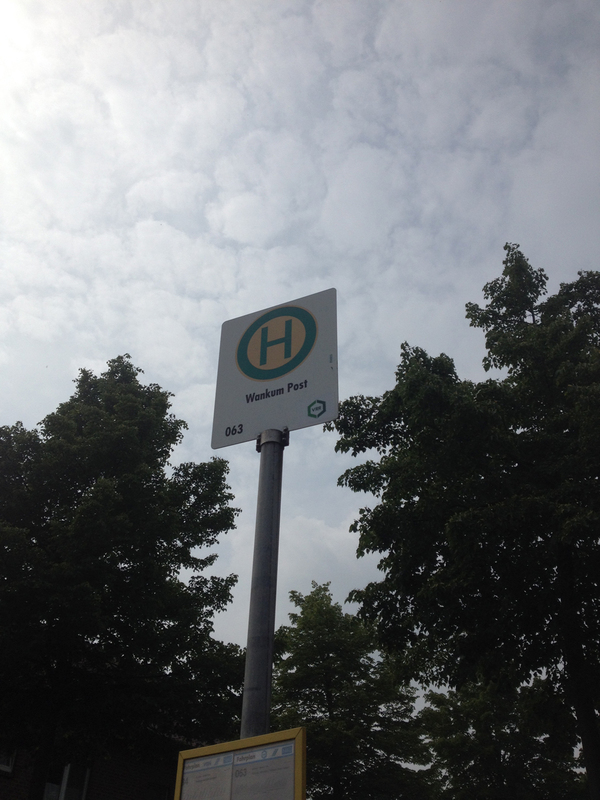 Another thing I noticed is that there seemed to be more fat people than I normally see in Germany (although they were probably Germans so perhaps they just don’t hang out in the Niederrhein area generally). 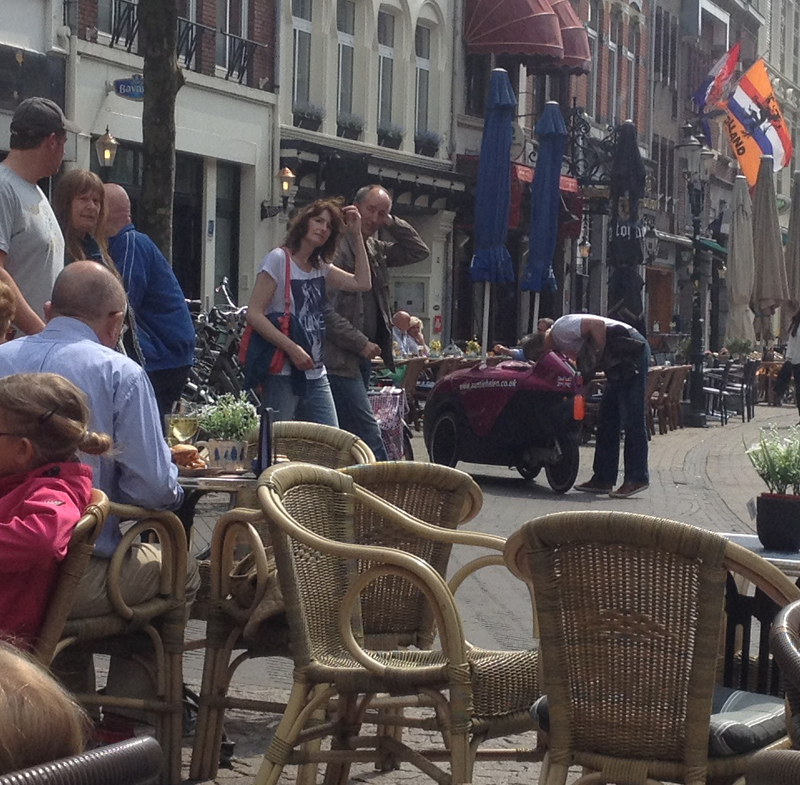 It was also very noticeable, whilst sitting outside, that there are lots more smokers than in the UK. I kept getting smoke wafting past me – I don’t like it very much. After an hour of lazing around with my food and generally people-watching it was time to head back. I set my Garmin for my alternative route back (the longer, more scenic version) as my legs still felt reasonable. I found myself passing an unexpected dinosaur. 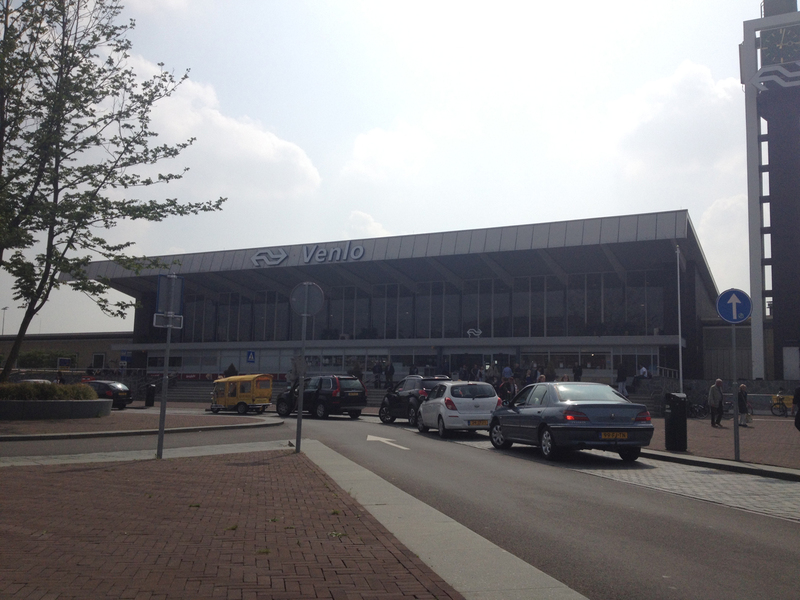 And shortly after I was at Venlo station – I waved goodbye to James here three weeks ago. The route out of Venlo when heading for the Hinsbeck area (rather than Herongen) is quite a steep climb. I’ve done it several times before (I visited Venlo a few times when holidaying in Nettetal a couple of years ago) and I got it wrong most times. This time I had what I thought was a good route plotted but lo and behold a cut-through between two roads (which cuts out a longer stretch of road) was clearly not velomobile-friendly. 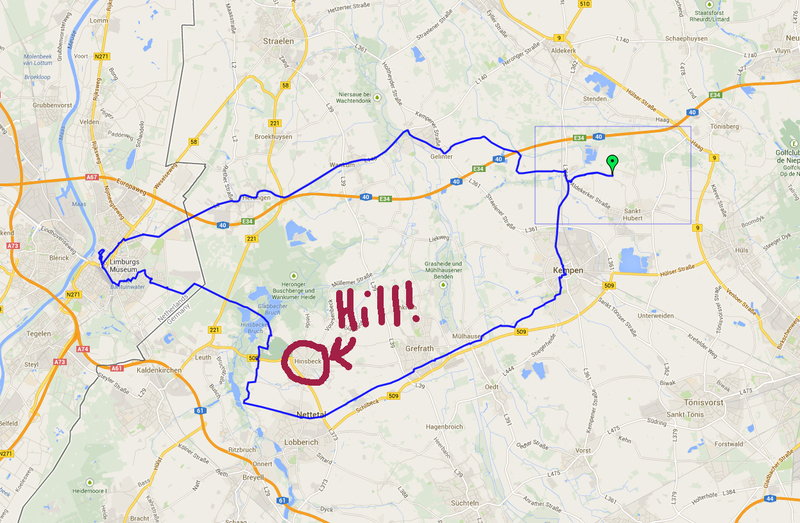 So I stuck to the main road and probably had an extra kilometre or so to ride – not a problem. I was slow up the hill out of Venlo but not appallingly so. I think I’m getting slightly more accustomed to the weight of the Versatile – I am certainly spinning the pedals more (which is good). Wilfred, who owned Penelope before Alex, reckons I could gear her down a bit more with changing the sprocket on the rear wheel, maybe to increase it by two teeth, and still be within the allowed range of the Rohloff. It’s not necessary for this bit of Germany but if I take Penelope back to England then I will probably have to do this, or something similar, otherwise I’ll conk out on some of our impressive hills. Anyway, I made it up the hill out of Venlo, riding on quiet residential roads so I wasn’t annoying any vehicular traffic. And from the other side (better lighting). 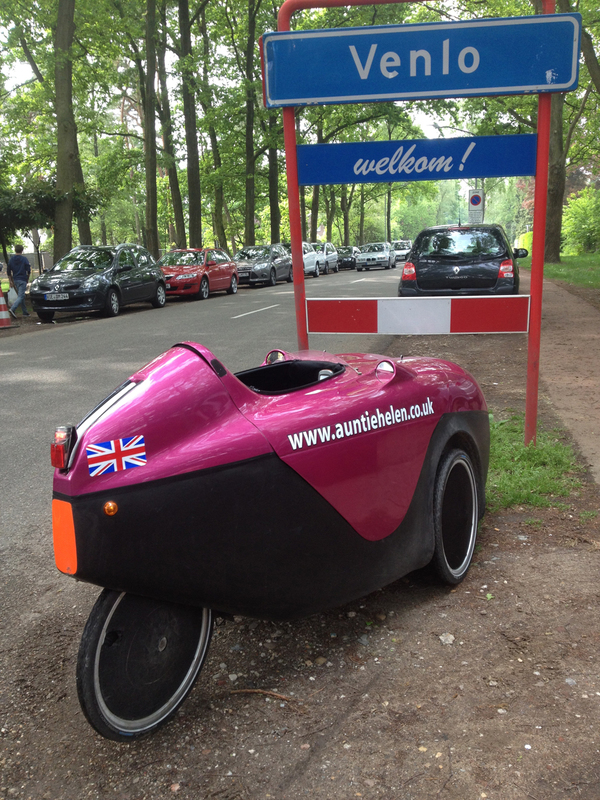 Her front wheels are in Germany, the rear wheel is in the Netherlands. This route is really familiar to me and I whizzed onward through the crowds of cyclists (they were everywhere – to be expected on a bank holiday I suppose!) It’s all asphalted track with no cars so is a great route for cycling. Yes, my big detour was to avoid a hill. aren’t I lazy! I probably added about 5km to the distance to avoid going up and over Hinsbeck but I enjoyed the quiet cycle lanes and joined the Bahnradweg pretty much at its start and followed it right through to Kempen. 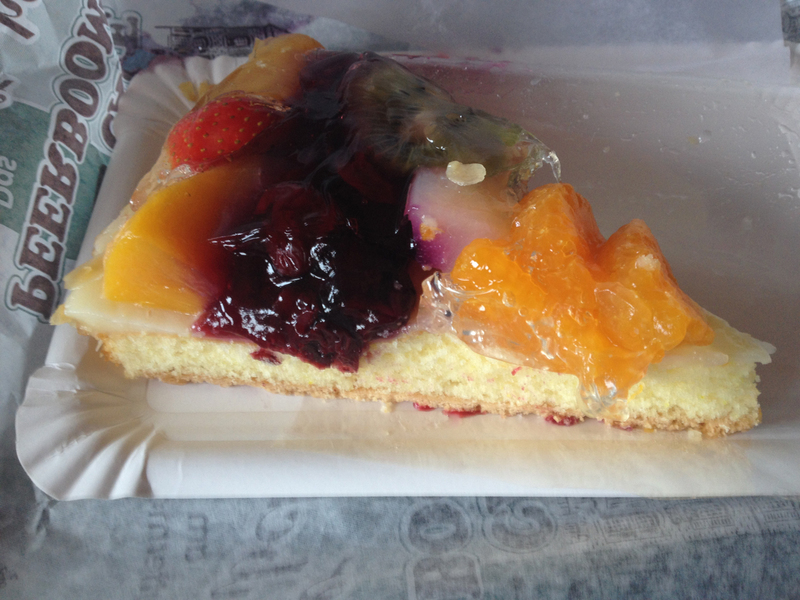 Not without stopping at Secretis, a restaurant/Eiscafé near Sassenfeld which I have visited before. 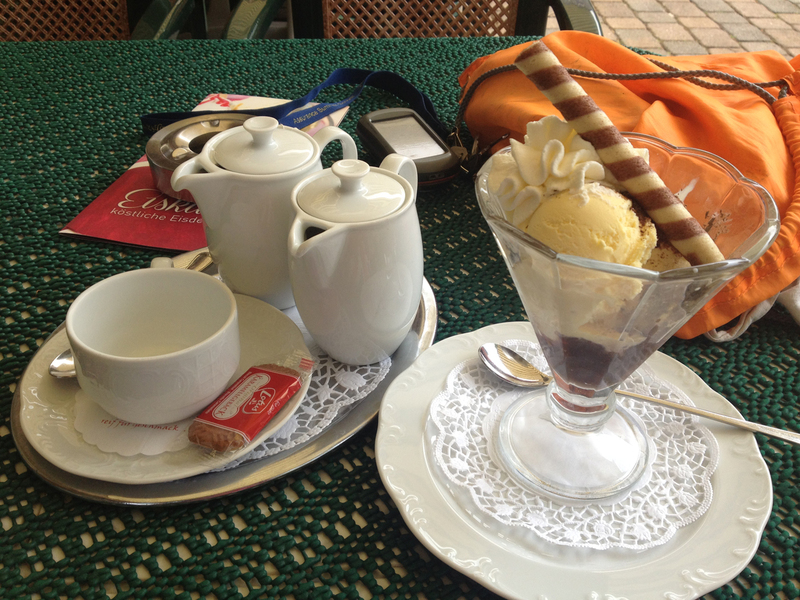 It was a really warm day so time for an ice cream and, miracle of miracles, they provided me with real milk for my tea! As I was heading off to leave after enjoying my ice cream the waitress and another customer came to talk to me about Penelope for ages. I have had lots of people asking me about her today, the most frequent question being whether she has electric assist. “Nur Muskelkraft” I reply. I still tend to ride faster than everyone else around (despite being a pretty slow recumbenteer/velomobiler). I think that Germans tend to use their bikes for utility cycling and they often have big, heavy, slow bikes that just keep going. Well, half of them are also dealing with the weight of electric assist too. There were a few racers out today I noticed but they tended to be on the roads not cycle paths and didn’t acknowledge me, even if I grinned at them (I can’t wave as my hands aren’t visible). The stretch from Lobberich back home is one I’ve done five or six times since I’ve been here so it’s becoming very familiar, and familiarity makes it seem a lot shorter. I whizzed back, although with so many people on the Bahnradweg I had to keep the speed down (only had a short stretch at 40kph). I used my useless hooter a fair bit and people didn’t hear it or realise what it was so I was reduced to shouting ‘Achtung!’ or ‘Vorsicht!’ instead which was marginally more successful. Rather than doing the little ring road around Kempen I went through the centre so that I could stop at a bakery which always seems to be open. And it was! 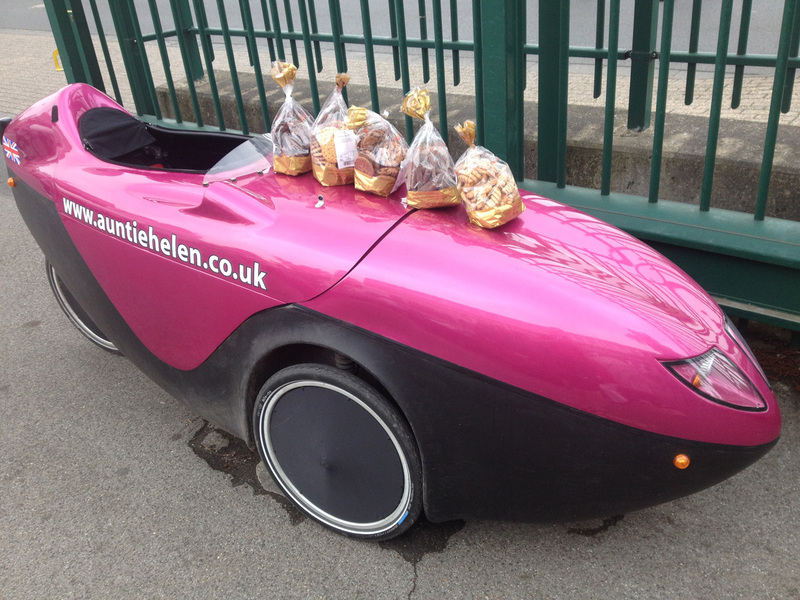 I bought myself a cake and provided some entertainment to all the people sitting at cafés in Kempen as I sailed past. When I got back Poppy was safely in the apartment (and hadn’t run halfway to Venlo) and I was pleased to see that my lights on Penelope were still working well. All in all a very enjoyable day’s ride but I still didn’t get any poffertjes!! Last year I asked gerrit tempelman to put in a larger rear sprocket: he said: can’t be done, no room for it. …. If I remembered it right, we changed a chainring not in the front but on the Rohloff hub. The Rohloff has 2 chainrings. The one on the right is connected to the chain going to the front of the Versatile, the left one goes to the chain going to the rear Wheel.. One of those 2 chainrings has probably been changed to a differend chainring in order to make the Versatile easier to drive uphill. My guess is the left chainring is changed from 32 to 29 teeth. The chainring on the rear axel from 16 to 18. At least, that’s what I have in a Excel spreadsheet document which I created when I ordered my Versatile. In other words I can change the front chainring and I guess it’s also possible to change the other side of the Rohloff (maybe). I may get used to it but I’ll probably take it back to Tempelman before I head back to the UK and see if he has any ideas. André Vrielink talked to me at SPEZI about changing the front chainring. Enjoying your adventures with Penelope very much. And very jealous of your cake stops. 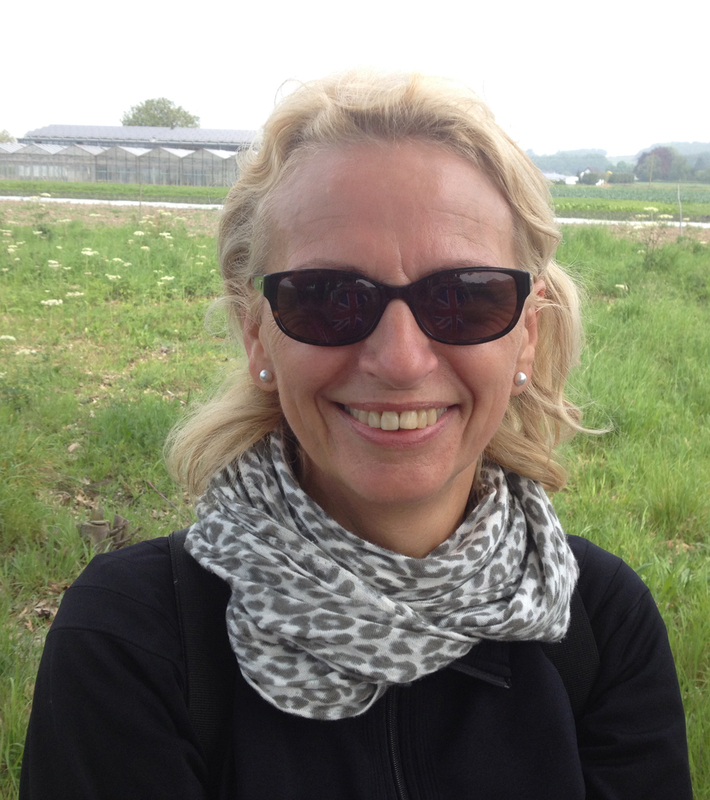 I am glad you are enjoying my blog posts – I’m enjoying doing the riding so I can write them!